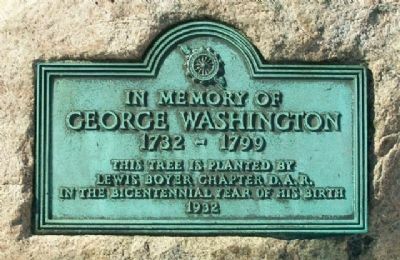 Erected 1932 by Lewis Boyer Chapter, Daughters of the American Revolution. Location. 40° 17.125′ N, 84° 9.323′ W. Marker is in Sidney, Ohio, in Shelby County. Marker is at the intersection of Main Avenue (Ohio Route 29) and Poplar Street, on the right when traveling south on Main Avenue. Touch for map. 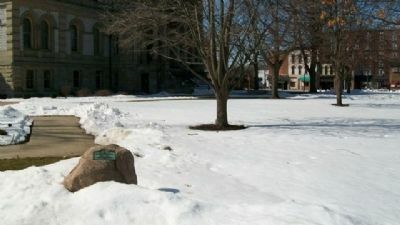 Marker is near the NE corner of the county courthouse grounds. Marker is in this post office area: Sidney OH 45365, United States of America. Touch for directions. (within shouting distance of this marker); The Shelby County Courthouse (within shouting distance of this marker); Shelby County Veterans Memorial (within shouting distance of this marker); Burkhart Building (about 300 feet away, measured in a direct line); Carey's Hall (about 300 feet away). Touch for a list and map of all markers in Sidney. More. Search the internet for George Washington Bicentennial. Credits. This page was last revised on June 16, 2016. This page originally submitted on April 11, 2010, by William Fischer, Jr. of Scranton, Pennsylvania. This page has been viewed 625 times since then and 5 times this year. Photos: 1, 2. submitted on April 11, 2010, by William Fischer, Jr. of Scranton, Pennsylvania.